George Lehmann was born May 1, 1942 in Riverside Township. George earned a reputation as a deadly long-range shooter at Camden Catholic. It was the product of endless hours of shooting drills. The wiry six-footer was also a gifted ballhandler and passer. George received a basketball scholarship from Wake Forest and played for the freshman squad in 1960–61. He then transferred to Campbell College (now Campbell University). Baseball stars Gaylord and Jim Perry were among its more famous alums. George went undrafted after graduating. He played the next four seasons in the Eastern Basketball League—two years with the Sudbury Mercuries and two with the Trenton Colonials. In his two years in Trenton, George averaged over 24 points a game. In the summer of 1967, he was invited to try out for the St. Louis Hawks. The ABA had begun play and there was a sharp drain on talent in the NBA. George made the Hawks as Lenny Wilkens’s backup. He played 10 minutes a game as a rookie and saw action in one playoff game. George accompanied the club on its move to Atlanta the following season, but was cut after playing 11 games. George signed with the ABA Los Angeles Stars in January and took over as the team’s point guard. He led the Stars with 18.9 and 5.0 assists per game in 1968–69. In 1969–70, the Stars drafted Mack Calvin. He supplanted George as the starting point guard, making him expendable. The Stars traded George to the New York Nets, where he backed up Bill Melchionni for 46 games. Toward the end of the season the Nets traded George to the Miami Floridians. In 25 games he averaged 17.9 points and 5.0 assists. George’s best season was 1970–71. He was traded to the Carolina Cougars, a team that featured a constellation of Carolina college basketball stars, including Billy Cunningham, Doug Moe, Larry Miller, Bill Bunting, Bob Verga, Randy Mahaffey and, of course, George. Their best player was Joe Caldwell, who had jumped from the NBA to the ABA over the summer. George set league records with 27 points in a quarter, and 154 3-pointers on the year. His long-range jumpers were known as "Screamin' Lehmanns." That season he also became the first pro to make more than 40 percent of his 3-pointers. The Cougars did plenty of scoring, but they gave up 105 points a game, and finished 34–50, and out of the playoffs. George had another good year for the Cougars in 1971–72, but the team continued its losing ways and he was traded to the Memphis Pros with a month to go in the season. The Pros changed their name to the Tams after the season. George spent his final two years with Memphis, splitting point guard duties with George Thompson. 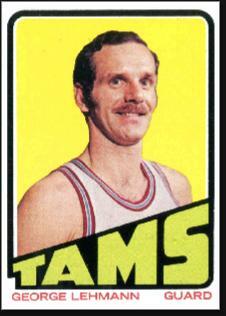 Midway through the 1973–74 season, the Tams released George. He played a handful of games with the Allentown Jets back in the Eastern League, but at 31, it was time to move on. When he retired, George had the third highest 3-point shooting average in history, at 36.5 percent. After his pro career, George returned to South Jersey and went into partnership with his brother, Austin, in a mail-order business specializing in novelty apparel. He also conducted basketball clinics. In 1989–90, George’s son, Todd, led the nation with 9.3 assists per game as a guard for Drexel. His daughter, Nicole, was a guard for NC State. Like their father, they were fearless and accurate shooters. Todd joined his father in business after college.